Clever and convenient, this 16 oz. foldable water bottle is perfect on occasions when space is limited. 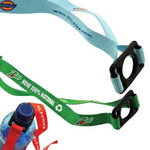 Patented and reusable, it includes an identification panel for the owner's name and a carabiner. This product is BPA and lead free, have FDA certificate.